See more photos from Teach-Out on Facebook here! See HUG’s photos on Facebook here. On August 13, 2016, Community Alliance for Global Justice (CAGJ) organized a Teach-Out at HUG and I was very grateful for the opportunity to get to know Dean, HUG and also spend some time interacting with mother earth directly. We started the day at 10am and after a go-around to introduce ourselves and say why we were here, Dean walked us through their personal story, the fascinating history of the area and the story of HUGs formation in 2010. Some of those stories are below, as best I can recall. Dean moved to Tacoma in 2008 to the Hilltop neighborhood, land of the Puyallup people. They learned the history of the neighborhood – it was a ‘red line’ community that had suffered much trauma by violence, gangs, incarceration, and more recently, gentrification. 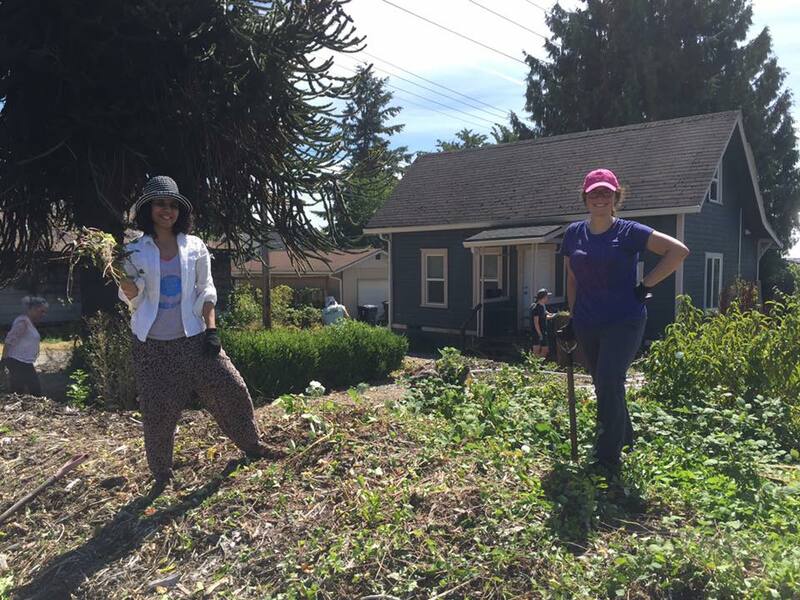 Dean took a master gardener course, feeling called to work with the earth and the land. They believe where there has been trauma, there is blood in the earth, and by connecting and working with the earth, we find healing. 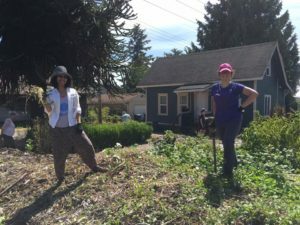 They started gardening and growing food in the neighborhood, on the sidewalk strips and sharing the produce with the neighbors. This was the start of what would become HUG. When Dean attended the US Social Forum in Detroit, they met and were inspired by other groups doing powerful food justice and food sovereignty work. The already felt a calling for starting something similar was catalyzed by the bold and powerful work of these organizations. Dean wrote a proposal for a grant to Social Justice Fund, to create a community based agriculture, justice and equity organization. When the grant came through, Dean saw it as the validation and blessing from Spirit that birthed HUG. 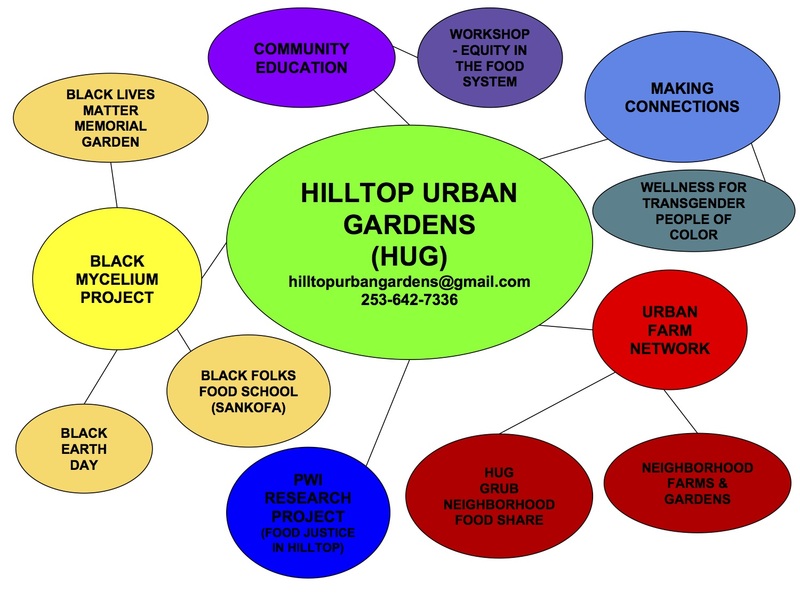 Today, HUG has a network of half a dozen “urban” farms, a large main plot with a couple greenhouses, and several community programs. The community volunteers time and labor, shares the food and is building connections and healing. 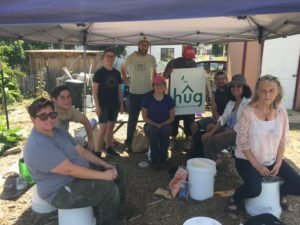 Saturdays is the HUG GRUB food share, from 1pm to 4pm, which is run by volunteers. People who stop by take food, and are encouraged to offer something back — inspiring examples have been plumbing skills and a grandmother who makes quilts for children in the neighborhood. Last year, HUG hosted the first Black Earth Day which was attended by several hundred people and was a great community gathering (watch a short video from Black Earth Day). It was a family friendly carnival style event with booths and music and food, and it demonstrated to the community that black people are environmentalists. There are several other programs and projects. To name a few — the Black Folks Food School, a three-part workshop exploring Equity in the Food System, and a very exciting new project — The Black Mycelium Project. A part of this will be the Black Lives Matter Memorial Garden — soon-to-be inaugurated at HUG. We asked our amazing host questions, and learned how to get involved and support HUG. Groups and volunteers are welcome Mondays and Fridays from 4pm to 7pm. You can also support by becoming a Monthly Sustainer, or making a one-time donation on HUG’s website. We then spent a few hours clearing a section of the plot that had a serious amount of bindweed aka morning glory. The tugging and pulling was oddly satisfying and 6-7 of us in the group chatted and exchanged stories. After lunch, we planted some collard seedlings in the greenhouse. Personally, I am deeply inspired by HUG and the work that Dean is doing. As a climate justice activist, I am often in a space of despair or frustration with the sheer severity of the crises we are facing and fighting. More than anything, I think connecting to the earth is a huge part of the solution. I also think centering people of color, and especially black people and indigenous people is the most important way to move toward a world without oppression. By learning to grow our own food, we bring back power into our hands. By being healthy, by being connected to community and the sacredness of earth’s life-giving force, we come back to love and unity. I look forward to seeing HUG’s ongoing and future projects, and I’m excited to be part of the community building a better world. Posted in Food Justice Blog Posts, Slider, Uncategorized.